YES. OH YES, Please let it be true!!!! On one hand, finally physically owning Megamix sounds awesome. 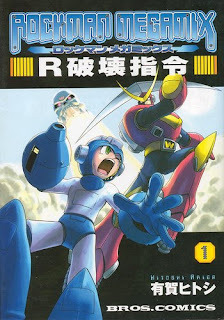 On the other hand, what will happen to Rockman Tanjou? the only problem, is that even if it's true, it still doesn't mean a thing. need i remind everyone of the metroid movie? they picked up the license about 2 or 3 times, but nothing ever happened. it kept expiring. so, i'll think nothing of it until i see more than just a license being picked up. on a similar note, if MMOCW and MMXOCW are still coming stateside, i'd love to have them. Is all of Megamix translated or is it only a few volumes. Awesome. I have been hoping this manga would see a translation. It has been too long. Also since I have read a manga, lol. Let us all hope! The Shadow here. I can confirm that these ARE happening. IDW will have multiple covers and this is not confirmed but Alex Milne will do some of the non-manga variant covers. More as this develops. PLEASE PLEASE PLEASE PLEASE PLEASE! However, let's hope they don't butcher it with stupid puns. Please keep the covers the same as the Japanese. Although my wish of keeping the name Rockman (instead of Megaman) is not going to happen. Damn, this just reminds me that I need to buy Megamix. Iwamoto X mangas, pleaase, PLEASE!!! Udon has done well in the one work of MM they have done so far, so I think they would do well with this. As far as Rockman Tanjou, uh, I guess they would continue to not update their site and continue to not fix all the broken links. Rockman Tanjou can host them for free. Or go out of business. OMFG. X Manga. In english.